Strange there are no reviews of CW watches in this sub-forum. I just got one, and I’m VERY impressed, so I thought I'd share my impressions. This incoming was not entirely planned. 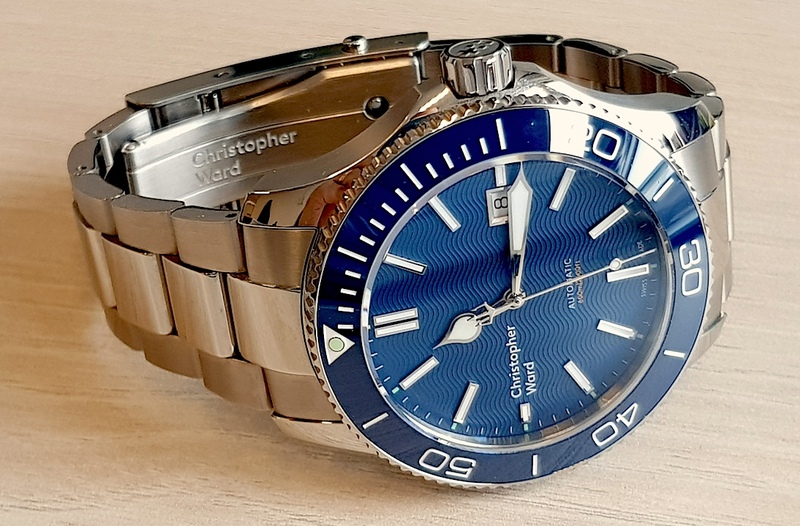 After being positively impressed by the Helson Sharkmaster 300 (homage to the 60s Seamaster) I bought last summer, I bought a Shark Diver 40mm in blue past December. And was much less impressed… The finish quality of the head and bracelet were clearly inferior and on top of everything it failed the WR test out of the box. So it went back for a refund. It is clearly a dress diver in design, but has some clear personality, drawing inspiration from many classic designs but not being a copy of anything. They have a solid reputation for good customer support too. I went for their flagship diver: the 43mm Trident Pro in blue, on the bracelet. And with the express delivery option I got it in just over 24Hs since I placed my order. And I have been EXTREMELY impressed by the quality of the whole package !! The packaging and presentation box are very much what you expect from a luxury product. But more important: The quality of this piece is absurdly good for a sub 1000 euro watch. IMO it is excellent value. The design lines of the case are pretty unique, and while it is a large watch (43mm, 51mm L2L), the lugs curve nicely down and wears very comfortably. The alternated polished and brushed surfaces are just perfect, with very crisp lines separating them. Everything is perfectly finished, the handset, the indices and the dial waves guilloché (rather shamelessly borrowed from Omega Seamasters). Dial printing is crisp and minimal: brand name at 9 (balancing the metal framed date window at 3) and two small lines of text at 6. Many brand enthusiasts are less than happy with the branding positioning on the dial, but frankly, I like it much better than the previous logo at 12. The ceramic bezel insert is glossy, with embossed numbers and the bezel action (120 clicks) is excellent. Overall it shows the quality of a much more expensive piece. The shade of blue of this generation of Trident is just right, IMO, the previous incarnation was a bit too bright. The end links fit the case very precisely. The bracelet is simple and solid. Essentially an oyster type with slightly raised PCLs. Finishing is, again, excellent. The removable links use pins and collars. Probably my only complain. Not because it is not well done, it is, but only because screws are easier to work on (and let’s face it, look better). The clasp is a very simple dual push-button design, but the finishing is very good. And it has a simple but effective tool-less micro adjustment in the spirit of the Rolex Glidelock. All in all, it works well without becoming bulky. Inside there’s a Sellita SW200 (ETA 2824 equivalent), and seems to be running at +7s at the moment. The watch is assembled and tested in Switzerland. I have to say that even at retail, this watch represents excellent value. It rivals the competition at two or three times the price. I once read something funny about the Rolex Sub: It’s the best $1000 watch that you can buy for $4000 (yes, those were the days…). I can say something similar of the CW: It’s a great $3000 watch that you can buy for $1000. Congrats but don't expect many positive reviews as most here loathe anything that resembles a submariner. Nice review.. I don't quite see it. IMO they have made every effort to make every aspect of the watch their own distinct design and different from the Sub. OK, maybe not the bracelet, but the clasp is substantially different too. If I see any resemblance is more to the Seamaster than the Sub. Talking about resemblance to the Sub I also find interesting that there's a review in this section of the Ginault Ocean Rover, which goes a bit beyond a simple resemblance, and people don't seem too disturbed about it anyway.